Jessica Warboys, 'Sea Painting, Birling Gap', 2017 (part 1). Mineral pigments on canvas, 1100cm x 200cm. Courtesy the artist. Jessica Warboys, 'Sea Painting, Birling Gap' (part 2), 2017. Mineral pigments on canvas, 1100cm x 200cm. Courtesy the artist. Jessica Warboys, 'Sea Painting, Birling Gap', 2017. Mineral pigments on canvas, 1100cm x 200cm. Courtesy the artist. The artist making the work on-site. Image courtesy Jessica Warboys. It is a pleasure to announce our acquisition of Jessica Warboys Sea Painting, Birling Gap, 2017, which was specially commissioned for Towner Art Gallery, Eastbourne. Warboys’ work strips the canvas from its frame and forces it into direct contact with the unforgiving elements of the windswept British landscape. 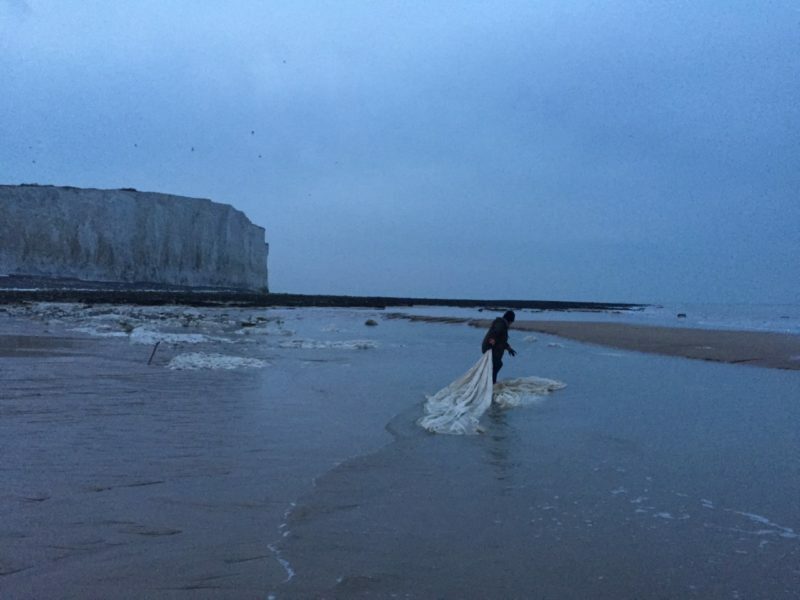 The work was made at Birling Gap, an enclosed beach set below white chalk cliffs near Eastbourne. It functions as a record of her collaboration with the landscape. The performative aspect uncovers the contingencies of that time and space – the wind, waves, rocks and tidal sea pools that disperse and drag the pigment into the creases and pores of the canvas. Her practice employs a variety of mediums ranging from sculpture, film and performance. Sea Paintings are central to Warboys’ work, existing at the crossroads of ritual, performance, improvisation and artistic process. It is an approach to making that seeks to manifest the physical and psychic dynamics that give a landscape its shape and meaning. They engage very directly with that border territory between the sea and land, the ‘edge in landscape’, that from the beginning has been at the heart of Towner’s Collection. From October 21 2017 – 4 Feb 2018, Towner Museum will hold an exhibition, ECHOGAP, showing Warboys’ work including Birling Gap, as well as new films and sculptures.